This brochure is Martin Publishing Services in a nutshell. It’s always hard to decide what gets real estate, but this is what I’ve narrowed it down to. I had to follow my own advice and not try to cram everything in. (That is often a problem with clients and ads/book covers.) It took several hours of choosing what is important, paring it down, adding design, revising, and paring it down some more until I had something I was happy with. 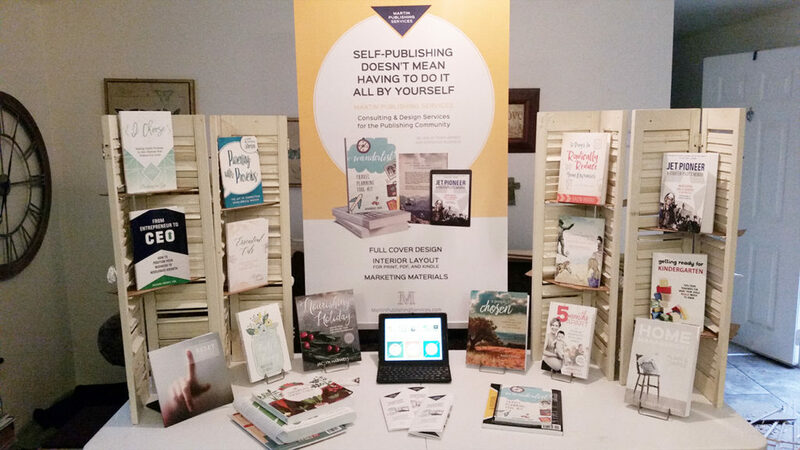 I have been preparing for the DFW Writers’ Conference: ordering copies of the books I’ve designed, ordering booth display stuff, building shelves, etc. As I assessed my booth, I thought, “Man, I wish I had an information packet to hand out to potential clients.” And then I was like, duh! I need a brochure. I think that’s a prime example of “can’t see the forest for the trees”. The next step was selecting elements for the brochure. I chose a 6-panel approach where each panel was a piece of stand-alone information. Front Panel: I knew this needed to be reserved for an introduction to my business. Back Panel: I knew this needed to be something that would also serve as an introduction if it ended up face-down somehow. I already have this information on my website, and I grabbed that text and pasted it in place. And it was way too much text. So back to the drawing board I went, really evaluating what was important, was it easy to understand at a glance, how I could get it to fit into the design I wanted to use, making sure that all of the elements used in the brochure were cohesive. When I design, I design with this question in mind: What would another good designer think about my work? What would a big-name publishing company think about my work? It was obvious that my first pass had no real design structure. It was very boring and clunky and served more as a data-dump. My goal with my company is to present a clean, modern style (which is why I’m not using the fabulous shabby chic shutters idea for my booth display, even though everyone loved it, lol). This is my test booth display in the comfort of my home. Hubby is building me some clean, modern custom shelves for my booth based on this concept. With “clean and modern” in mind, I started to work on the design. I knew that I wanted something that would help with content separation, so for the front, I added the yellow box at the bottom and notched it out, representative of the triangle I use up top. (The ABCs of design–Always Be Cohesive.) For the back, I used colored text and different sized text and cut the text way back. It’s still not “the one” but it’s getting there. From that step, I got to work tightening it up, closing gaps, adding small color elements, cutting more text, and going a slightly different direction for the inside middle panel. I really hated to let go of what I had in the middle panel, because that is what sparked my whole “I need an information packet” idea. I wanted to let the client know that with me, they get a style sheet. I used the graphic in the middle because my client’s book had been endorsed by Jeff Goins, author of The Art of Work, and I really like that graphic. I wanted to use the press kit because it’s also one of the services that I offer and I just love that design (and the author). However, at the end of the day, I was not satisfied with the way they fit in with the rest of my brochure because of their size and their color. Also, the press kit and the style sheet were not self-explanatory. I know by now that design has to be simple and understandable at a glance. That’s the purpose of design! I am, however, taking print-outs of the style sheet and the press kit for conversation kindling. My choice for the middle interior switched to displaying other sample work. The 3 new elements I selected all fit nicely in a horizontal display and require no real thought as to what they are. One can tell at a glance. There is always room for improvement. I am my own worst critic. And I am very pleased with my end-product. The real test will be to see what I think of it in two years, lol. I’m still waiting on the shipment of my actual brochures, but it’s always great to have a good tri-fold brochure mockup on hand. You can also download a PDF version if you want to get up close and personal with it.